ALERT:Before you purchase, check with your instructor or review your course syllabus to ensure that youselect the correct ISBN. Several versions of Pearson’s MyLab & Mastering products exist for each title, including customized versions for individual schools, and registrations are not transferable. In addition,you may need a CourseID, provided by your instructor, to register for and use Pearson’s MyLab & Mastering products. Access codes for Pearson’s MyLab & Mastering products may not be included when purchasing or renting from companies other than Pearson; check with the seller before completing your purchase. 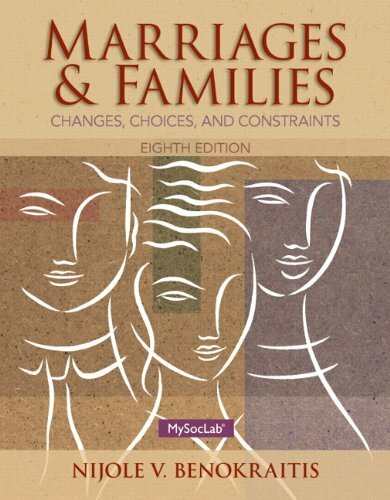 Marriages and Families: Changes, Choices, and Constraints, 8/eoffers students a comprehensive introduction to many issues facing families in the twenty-first century. The author explores contemporary changes in families and their structure, impacts on the choices available to family members, and constraints that often limit our choices. This approach will help readers better understand the families in which they were raised and are forming themselves. With the most up-to-date material and emerging issues on family behavior, students will be able to make better decisions in their everyday lives. MySocLab is an integral part of the Benokraitis learning program. Engaging activities and assessments provide a teaching a learning system that helps students see the world through a sociological lens. With MySocLab, students can develop critical thinking skills through writing, explore real-world data through the new Social Explorer, and watch the latest entries in the Core Concept Video Series.